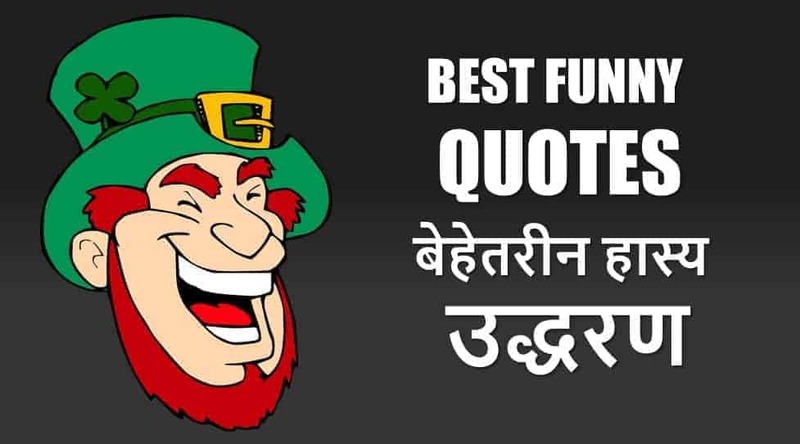 40 बेहेतरीन हास्य उद्धरण Best Funny Quotes in Hindi, क्या आप कुछ बहुत ही बेहतरीन मजेदार उद्धरण हिंदी में(funny quotes in Hindi) पढना चाहते हैं? #15 I like doing a funny show where I don’t have to act and fall in love with a girl. #19 A man who correctly guesses a woman`s age may be smart, but he’s not very bright. #1 Life is not about how you survive the storm, it’s about how you dance in the rain. #2 Life doesn’t have any hands, but it can sure give you a slap sometimes. #6 My silence spoke a thousand words, but you never heard them. #8 Retirement is great, you get to be your own boss and tell yourself to do nothing all day. #9 Life is a pretty chazy game, but at least it has good graphics. #10 I like life. It’s something to do. #7 Friendship is not about people who act true to your face. It’s all about people who remain true behind your back. #8 A best friend is someone who makes you laugh …when you think you’ll never laugh again. #9 If you hurt my best friend, I will kill you, Look like an accident. #10 I don’t know what’s tighter, our jeans or our friendship.